A television reporter went to interview a successful entrepreneur in her community. She wanted to do a news story documenting his successful life in business and philanthropy. “What did you do then?” the reporter asked. The reporter was very excited. She was already seeing the Emmy award that was sure to come from her reporting on this human interest story. This news story kind of ended before it began, right? It was definitely not the ending the reporter was expecting? Me neither. But I did find it interesting that the entrepreneur was not afraid to share openly how his great wealth from meager beginnings came not necessarily because of his own greatness and ability. It came, more so, because he was connected. I think that’s a little like our own journeys as people who seek to follow the risen Jesus. People who try to be children of God in this tangled up mess of a world in which we live. In this Easter season, it’s important that we remember that our life in Christ has little to do with how hard we work or how creative we are or how much money we make. Our life together in Christ has to do with how we’re connected. I think a lot of us miss that. And maybe Jesus needed to use the metaphor that he uses in our gospel reading today, because people in Jesus’ day missed that connection too. I think what’s important for us to hear in all of these statements, is that they are active and the result of what God has done for us, not the result of something that we have done first in order for God to pay attention to us. We live in a world where we often measure success by working as hard as we possibly can. We behave as if God’s ability to love us is dependent upon how successful we are or even think we are at something. If the focus of our life together is only about me and what I can do to make me the most successful me that God has ever seen, then I’ll be the first to admit that I am deeply offended by Jesus words in today’s gospel. Let’s face it – we live in a world with a false promise of our individual self and just how great we think our self is. Being a follower of the risen Jesus Christ is much different than that brothers and sisters. In essence, we are not branches that go at it alone and live without being connected to the vine. In fact, I believe that when we forget about our connection to the vine we quickly discover that the source of our life together is missing. So how are we as the community of Good Shepherd Lutheran Church connected to the vine as Jesus calls it today? You and I are connected through the gift of God’s grace, given to us in the life, death, and resurrection of a savior named Jesus. In that connection, we are branches on this vine. And God’s work in and through, as branches of this vine, bears good fruit. This past Friday, Good Shepherd joined the University of Mary and the North Dakota Highway Department to sponsor an event called Leadercast. Leadercast takes place live in Atlanta, Georgia and is broadcast at the same time to hundreds of locations around the world. On Friday, several hundred people gathered in Bismarck, over 120,000 people worldwide, to learn and grow as branches on the vine. Leadercast is a relationship that Good Shepherd celebrates with other branches on God’s vine like the University of Mary and the North Dakota Highway Department, who are not churches. And it bears good fruit. The quilting ministry of Good Shepherd creates quilts that are given as gifts to families at every celebration of the sacrament of Holy Baptism in our congregation. Over 100 each year. They’ve also created hundreds of quilts that provide shelter, protection, and warmth to brothers and sisters around the world. Our quilting ministry has many branches connected to God’s vine that bear good fruit. There are two mission projects that we are lifting up during the month of May – one in support of our Bible camp, Camp of the Cross and another to support the Central African Republic. We are branches of the same vine as our brothers and sisters at Camp of the Cross and in the Central African Republic. During the month of May, we are being invited to bear good fruit that will serve the needs of our neighbor – the good fruit in this these mission efforts might be a can of Chicken Broth, a box of Sharpie pens, or a roll of quarters in a tube of M&M minis. Brothers and sisters in Christ, you and I are connected to God’s vine. A vine that is way bigger than anything we can imagine or anyone we see sitting near us right now. You and I are connected. 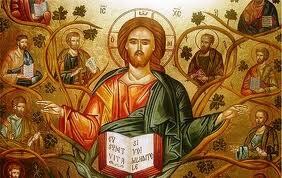 And because of Jesus, the true vine, may we always be branches that seek to bear good fruit in all that we say and do. Thanks be to God for the gift of the true vine, Jesus Christ our Savior and Lord. Amen. This entry was posted on Sunday, May 6th, 2012 at 11:55 pm	and posted in Recent Sermons. You can follow any responses to this entry through the RSS 2.0 feed.